Pinkfresh Studio is celebrating it’s 5th birthday! Congratulations on your growth and beautiful collections! I have some information below about special promotions and giveaways, be sure to check it all out! I made a layout using Everyday Musings to celebrate! I used lots of blue and lavender out of the collection. I added mixed media to the background with splatters and paint pounced through a stencil. I used a large photo of Mr. Whiskers in his favorite position (receiving pets) I dediced to have a vertical line of my embellishments to the side of the photo. I lined up the purple frames at the top and bottom of the line and then scattered embellishments down the line. I love the little frames for keeping embellishments more “organized” for me it seems easier to add more without it looking too random. I’m quite happy with how the layout turned out! Everyday Musings is so versatile and fun to work with! Be sure to keep reading for the celebration information! First is a free die (XO word) with purchase. There is no code necessary, and the die will automatically load into your cart while supplies last. Pinkfresh Studio will also be offering free/discounted shipping from April 5-7th on orders $25+. Use the code FREESHIP5THBDAY. Shipping is free in the USA, and $5.50 off for our International friends. 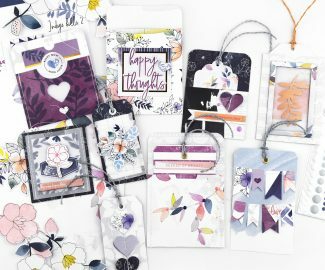 There will be (3) Grand Prizes picked from the Pinkfresh blog: Liquid Watercolor full set, Set of our 3 current paper collections, and the entire April Essentials die release. Each of us on the blog hop will be giving away a $25 giftcard – the winners will be picked from the comments. Winners will be picked and announced Sunday, April 14th on our GIVEAWAY PAGE. You will need to check that page & claim your prize within 2 weeks. Love your layout! Love the mixed media background. The embellishments are so pretty. What a cute cute layout ! I love it! Love the colors and they go so well with the photo! Such a beautiful stenciled background! Aww, so pretty and sweet! Such a pretty layout and I love the colors you used. Love the embellishments too and the great photo! Such a fun layout! I live that you used blue & lavender! 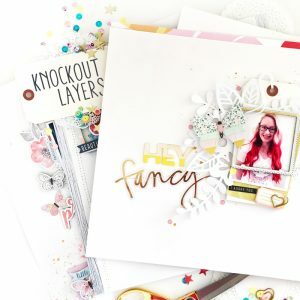 Such a cute layout – love the use of the frames! 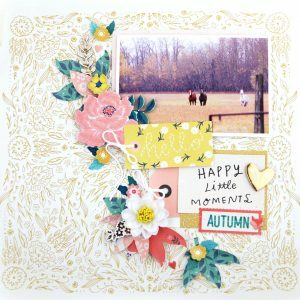 A beautiful layout …… and such perfect little embellishments! Love, love! What a sweet layout … love the soft purple carried throughout. What a fun layout! The color choice is spot on! Great job! Great layout… love your splattered and pounced background and all the pretty accompanying embellishments. Any layout with a kitty has my heart! Cute layout. Love the colors and of course the subject matter. Great job! All that purple makes me happy. 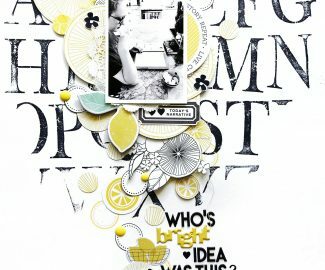 Love the mixed media splatters, cute layout and kitty! Love this layout! You have a beautiful blog! Love the layout you created and the use of the purple throughout. What a fresh and lovely layout! Wonderful layout and beautiful cat. Thank you for the inspiration! Lots of little details that all played up beautifully! Love this layout! Your cat is adorable too! Thank you for sharing! Love the colors and the embellishments! Simply nice. Love the splatter of colors and this fun layout.Thanks for the great inspiration! Gorgeous layout. I love the little frames and embellishments and all that color. Mr Whiskers as pretty cute too! Life is so much better with fur-babies! Endearing and lovely layout! Love the colors you used! Love the kitty! Love the way your embellishments are scattered between the frames. It is a perfect page! And perfect the celebrate the 5th year! What a beautiful layout! I love the shades of purple embellishments- matches your photo nicely! Love your pape. The orchids color really pops. Love the design. I will have to try it for myself….. So pretty! Love the pic with that sweet kitty! Beautiful colors and details! Beautiful layout! I love seeing purple being used, finally getting some love! The vertical line of embellishments is perfect! Super cute! Love purple and blue. Happy 5th Birthday to Pinkfresh Studio. 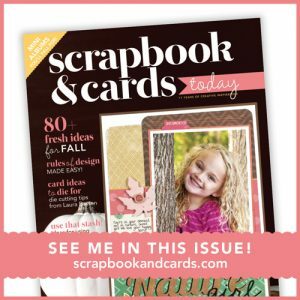 It is an amazing blog hop. What a beautiful layout, the colours and all the elements go so well together! Love it! Thanks so much for your gorgeous inspiration! I adore this layout and in part because I’m a cat lover, lol! Thanks for the inspiration! What a beautiful layout! I love the touch of gold! Wonderful layout, love the color combo and the photo of Mr. Whiskers. Thanks for sharing. Oh this is such a beautiful layout… I love those purple shades!! And I love the loose, artistic look. So beautiful! Gorgeous! I love the touch of mixed media in the background – still great while space but also a hint of more. Perfect! Fabulous page! Love all the fun colors and your wonderful style. Very sweet layout. I love the lavender elements and the sweet photo. LOVELY lavenders in your layout! you can never go wrong with a)purple and b) cats. However, your layout is more than that. it’s really eyecatching. I love your beautiful page! The colors are amazing. What a sweet layout. Love the color scheme. Great use of the Pinkfresh Studio products. Thanks for sharing your creativity! Pretty layout, Thanks for sharing. 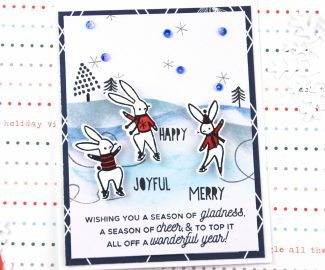 So much joy and happiness portrayed in this beautiful layout! Love your use of the frames! I love your layout. It’s a great design!! I love that beautiful cat, he’s adorable!! Your layout is beautiful and the colors you used is so gorgeous. Lovely layout & a good use of frames. You should be happy with the way it turned out! I think it’s wonderful & I also love the picture. I stop & pet each & every cat & dog I come across. Thanks so much for the inspiration! You are absolutely right about the frames pulling the items all together. I’m going to have to try that with some of my little items I think are adorable but aren’t for sure how to use! Beautiful layout, I really like the background. Fabulous layout for this sweet photo. Love your design and photo of your cat. Great layout! Very beautiful layout. I love the bold sentiment in the corner. Congrats to Pinkfresh Studio on completing 5 years. I love your products. Wishing you many more successful years ahead. Lovely page with the soft blues and purples! Beautiful layout with great design and lovely colors. 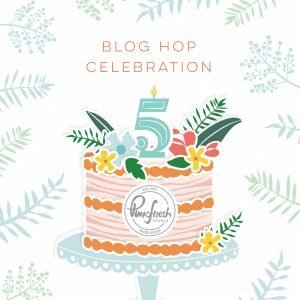 This has been an amazing blog hop celebrating Pinkfresh Studios’d 5th birthday. I wish you many more and I love your papers and want to try the liquid watercolors. Mr. Whiskers is so adorable! I had to mention that first because I love kitties! Your layout has such sweet little embellishments – the heart, the frames and the potted plants. It’s a beautiful design and lovely colors! That photo is precious, and your layout is lovely! I really like how Pinkfresh does their collections such that you can pull out just a few colors like in this layout. I love the lavender splatters under your focal image. Thanks for sharing with us! I just love how playful your page turned out. Mahalo for putting on such an awesome blog hop! I am in love with everything the design team has created!! Good luck everyone! LOVE your sweet kitty photo!!! Your LO is so pretty and adorable. I would love for you and Mr. Whiskers to join us in October for the annual Cat Lovers Hop on my blog. It’s a whole week of cats, cat tales, cat projects, and cat prizes!! Sweet kitty cat and you are the queen of splatters! Your kitty is a beauty! Such a sweet layout and combination of elements. What a heart-warming layout. Beautiful job. Love the purple Lacey background you’ve created! so sweet! luv how you framed the smaller elements!